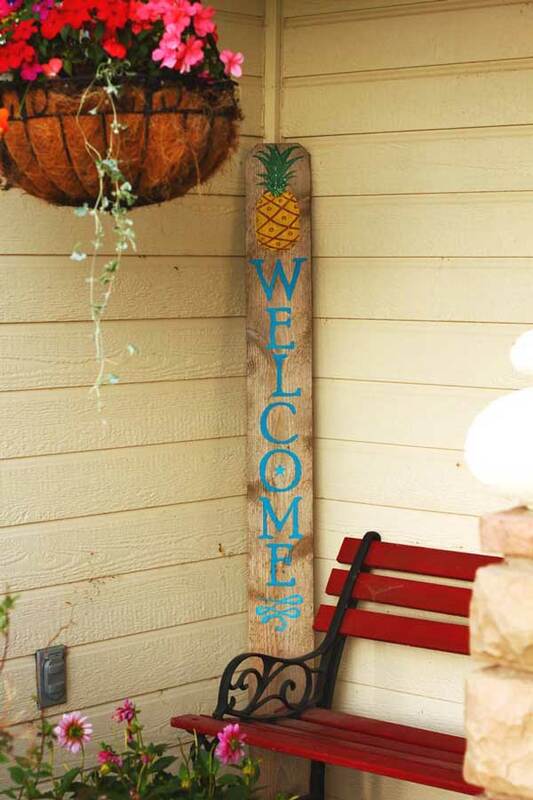 Bring some Aloha to your summer porch with this easy doormat project. 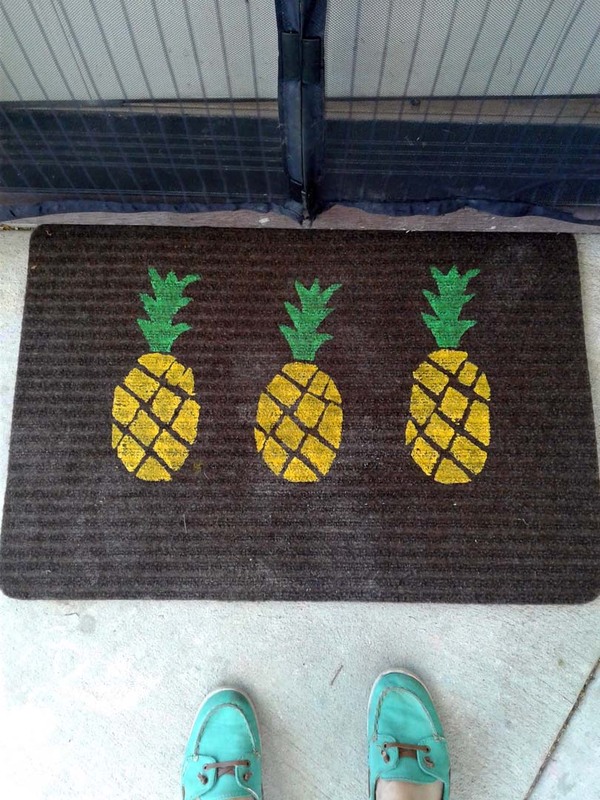 This entry was posted in Home Decor, Painting and tagged Aloha, door mat, Paint, Pineapple, sponge, Summer, welcome on June 21, 2018 by Michelle. 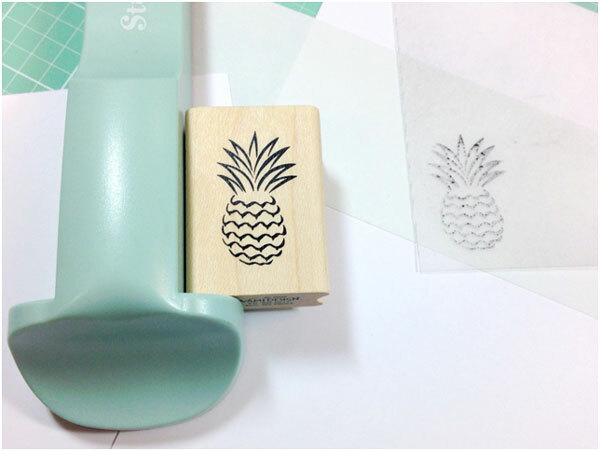 There are many reasons I love rubber stamps. The artwork on the front, how they make a really great stamped impression, and the old-fashioned feel you get when you use one. 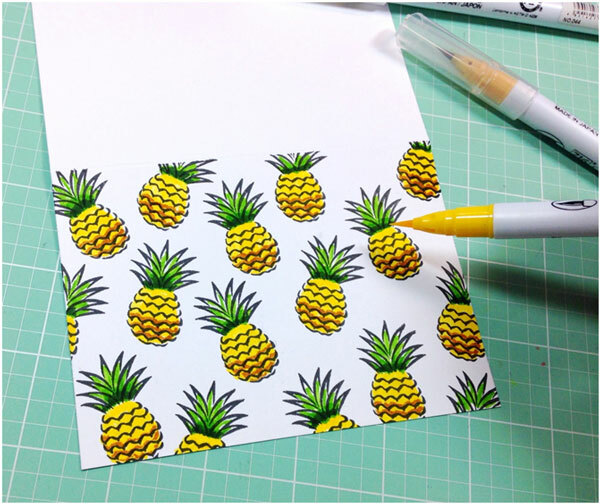 The only difficulty can be when you want to place the stamped image in a certain spot on your project, but cannot tell if it’s going to be where you want it to be. 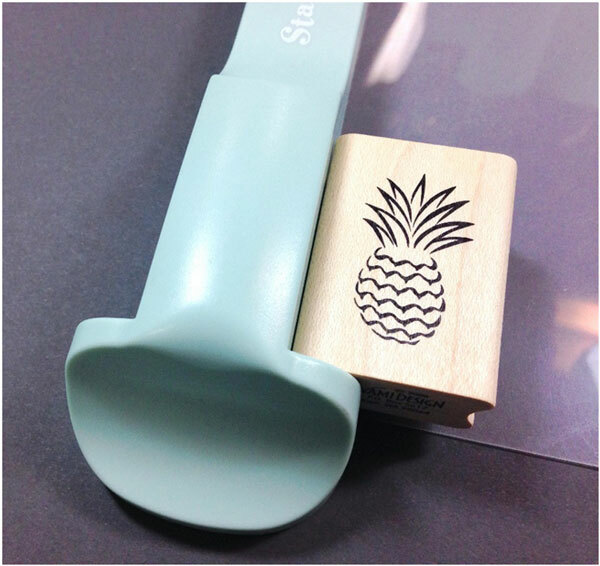 Unlike clear, acrylic stamps, you cannot see through the top to know where your image will stamp. That’s where the Stamp-A-Ma-Jig comes in. This handy tool is so easy to use. For today’s project, I’m going to be using one of my small wooden stamps to create a background on the front of a note card. I’ll show you how I get perfect placement every time. 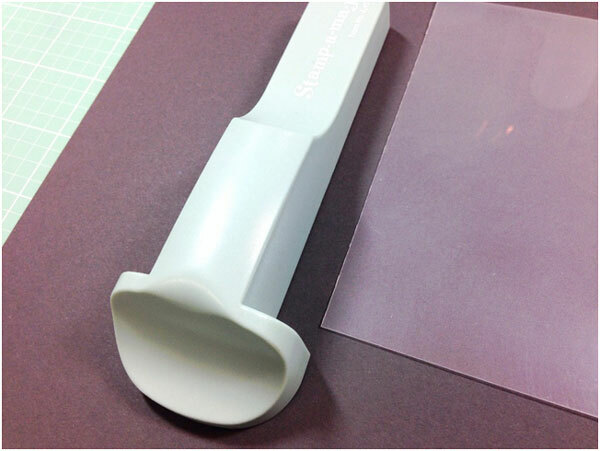 The first thing you want to do is line up the plastic sheet that comes with the tool into the corner of the tool. Be sure you have the smooth side facing up. 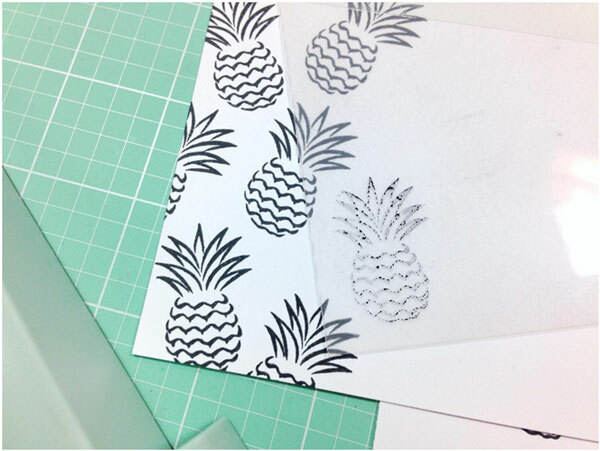 Then, using a dark ink, stamp your stamp up against the corner on top of the plastic sheet. 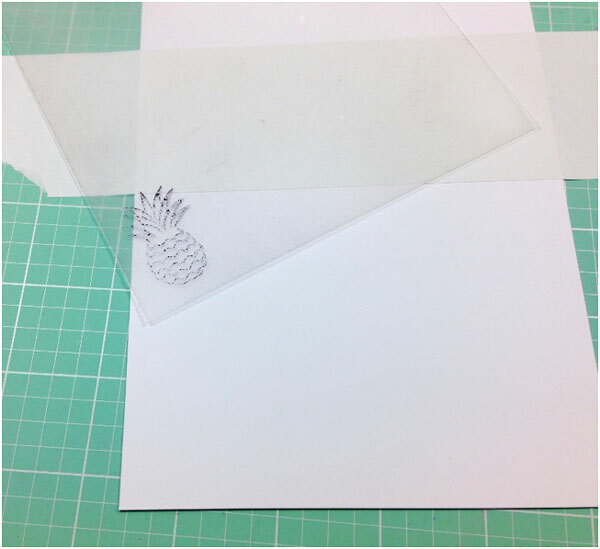 Remove the stamp and the tool, and place the plastic sheet on top of your card arranging the image where you want it. In my case, I used a 3.5”x 4-7/8” (4-bar) note card. I used some Post-It Tape to mask off the back of my card to prevent ink from getting on that part. 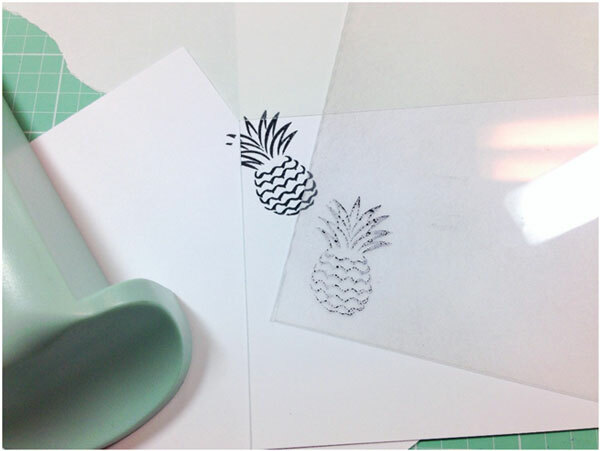 ….and replace the plastic sheet with the inked stamp. Repeat the process again, with the plastic sheet moving it to the next area you want to stamp on the card. 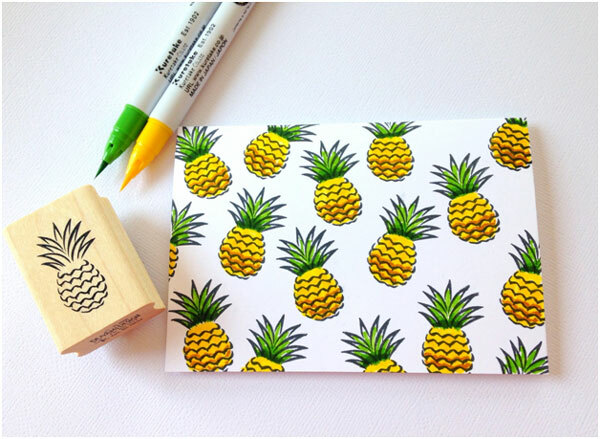 Continue on creating your background, placing the image at different angles and off the card for interest. 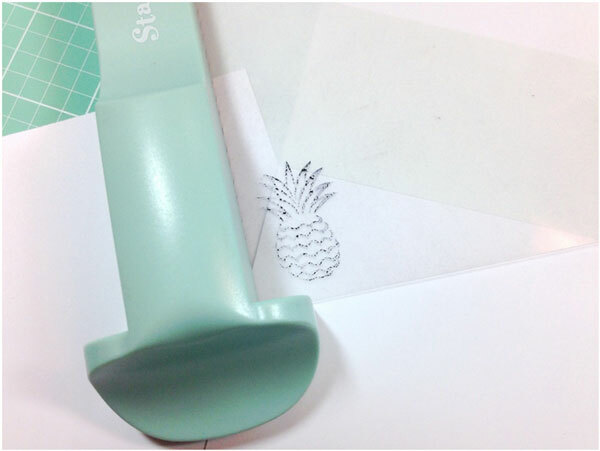 When you are finished, peel off the Post-It Tape and color in your images. I used Zig Clean Color Brush Markers because they do not bleed through the paper. 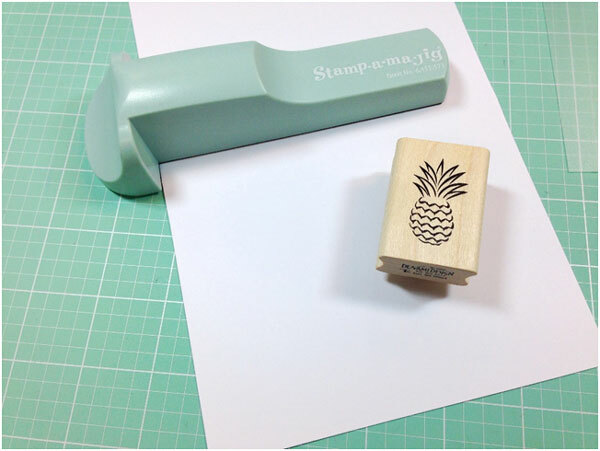 The Stamp-A-Ma-Jig is such a fun tool to use and it’s useful for all sizes of wooden stamps. 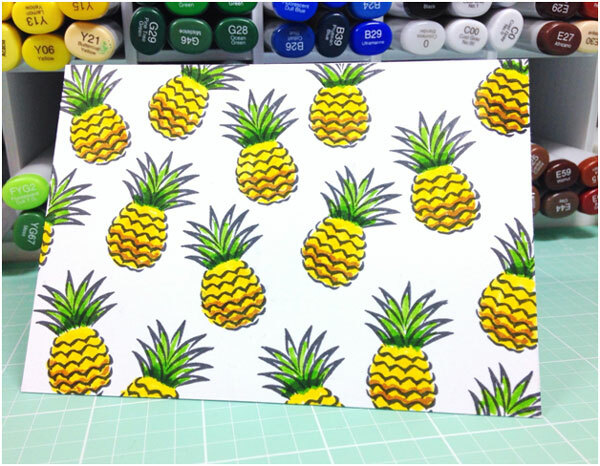 This entry was posted in Crafts, Paper Crafts, Rubber Stamping and tagged Craft Techniques, Pineapple, Rubber Stamping, Stamp Tools, Stamp-A-Ma-Jig, Stamping on May 22, 2018 by Heidi.